Completing 25 years last year, the Los Angeles Metro is a rapid transit with both, heavy and light rail serving Los Angeles County, California. The system operates on 6 lines, out of which 2 are heavy rail lines and 4 are light rail lines. Nearly 100 km long in length, the metro serves a total of 93 stations. The monumental task of operating such a crowded metro, with a daily ridership of 348,158 (2014), is under the hands of Los Angeles County Metropolitan Transportation Authority. The metro, in connection with the Metro Liner bus rapid transit system as well Metrolink, proves to be an efficient means of public transportation in Los Angeles. Map of Los Angeles Metro showing various lines and stations. Click on the map to enlarge it. The metro operates seven days of a week from 5 am to 12 am on weekdays. Between 12 am to 5 am, limited service is provided on some segments. On Fridays and Saturdays, the last drop off is around 2 am. The trains operate at an interval of 5-10 minutes during the rush hours. During middays and weekend days, the interval is 10-15 minutes, while, during the evenings and nights, the service operates every 20 minutes. Students as well are liable to pay only a reduced fare. A one-way ticket for Student K-12 costs just $1, while the price for the people under the College Vocational category is $1.75. A 30-day pass for the people under the College Vocational and Student K-12 demography costs, $43 and $24 respectively. There are free parking spots available at most of the stations. However, overnight parking facilities are not available in all the stations. All animals are not allowed on the metro. Guide animals for the disabled and small animals that can be completely concealed, are the only ones who can use the metro service. It is the responsibility of the handler to take care of the animal and make sure that it, in no way causes a nuisance and dirties the place. Wheeled vehicles like bicycles, skateboard etc are not allowed on the metro. Travelling with an adult is a must for any child with a bicycle, who is under 14 years old. Smoking, eating and drinking is prohibited. So is, blocking people. Gambling, graffiti, spitting, carrying explosive substance and other similar things are banned within and in close proximity to the metro facilities. The rapid transit system consists of 6 lines including two subway lines and 4 light rail lines. The metro lines are recognized by its color. Currently 6 metro lines operate in Los Angeles county. 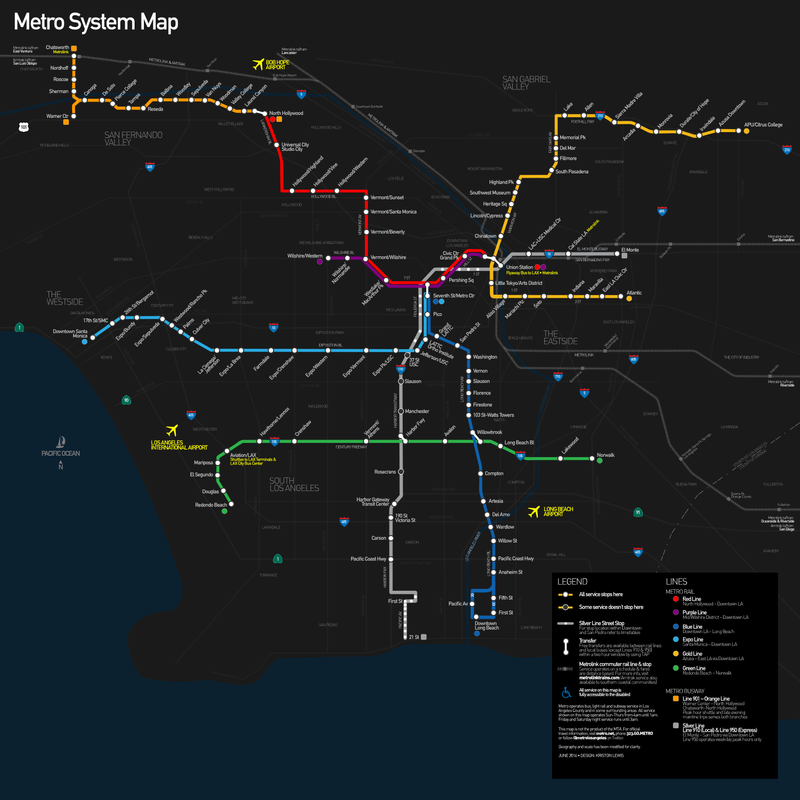 ● Red line – The first line of the LA subway system is the red line and it was opened to the public in 1993. The metro line runs from Downtown Los Angeles to North Hollywood and it passes through the surrounding areas of Hollywood and Mid-Wilshire. The entire line is built underground and the length of the route is 26.4 km serving 14 stations. ● Purple line – The purple line started operation in 2007 and the metro line runs between Downtown Los Angeles and Koreatown or Mid-Wilshire. The entire line is built underground. The length of the route is 10.3 km and it shares track with metro red line. The line serves 8 stations. ● Blue line – The blue line started service in 1963 and the length of the route is 35km serving 22 stations. The metro operates between Downtown Los Angeles Financial District and Downtown Long Beach. At the southern end the line turns single track loop and it takes 53 minutes to complete the entire route journey. ● Green line – The green line is fully elevated green line that runs between Redondo Beach and Norwalk. The green line also offers indirect access towards Los Angeles International Airport. The green line started operation in 1995 and the length of the route is 32km serving 14 stations. ● Gold line – The gold line was opened in 2003 and the line operates between East Los Angeles and Pasadena. The length of the route is 50km serving 27 stations. The gold line was extended towards east from Union station. ● Metro Expo Line – The rapid transit system operates between Downtown Los Angeles and Culver City. The first section of this line was opened in 2012 and the underground line is 24.5.9 km long serving 19 stations.